The Russell Senate Office Building (built 1903-1908) is the oldest of the Senate office buildings as well as a significant example of the Beaux Arts style of architecture. It occupies a site north of the Capitol bounded by Constitution Avenue, First Street, Delaware Avenue, and C Street N.E. Northeast of the Capitol, site bounded by Constitution Ave., First St., Delaware Ave., and C St., N.E. 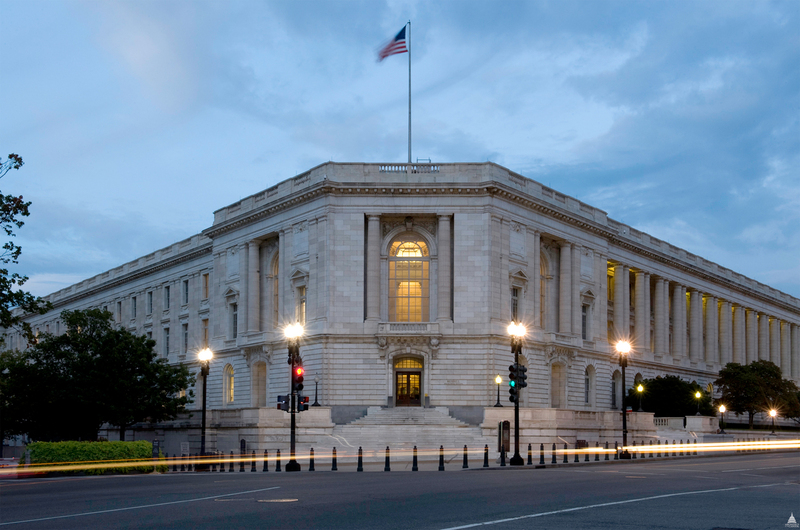 The first congressional office buildings were constructed immediately after the turn of the century to relieve overcrowding in the U.S. Capitol Building. Previously, members who wanted office space had to rent quarters or borrow space in committee rooms. In March 1901, Congress authorized the drawing of plans for fireproof office buildings adjacent to the Capitol Grounds. In March 1903, the acquisition of sites and construction of the buildings were authorized. In April 1904, the prominent New York architectural firm of Carrère and Hastings was retained. John Carrère took charge of the Senate Office Building project, while Thomas Hastings oversaw the construction of an almost identical office building (now named the Cannon House Office Building) for the House of Representatives. 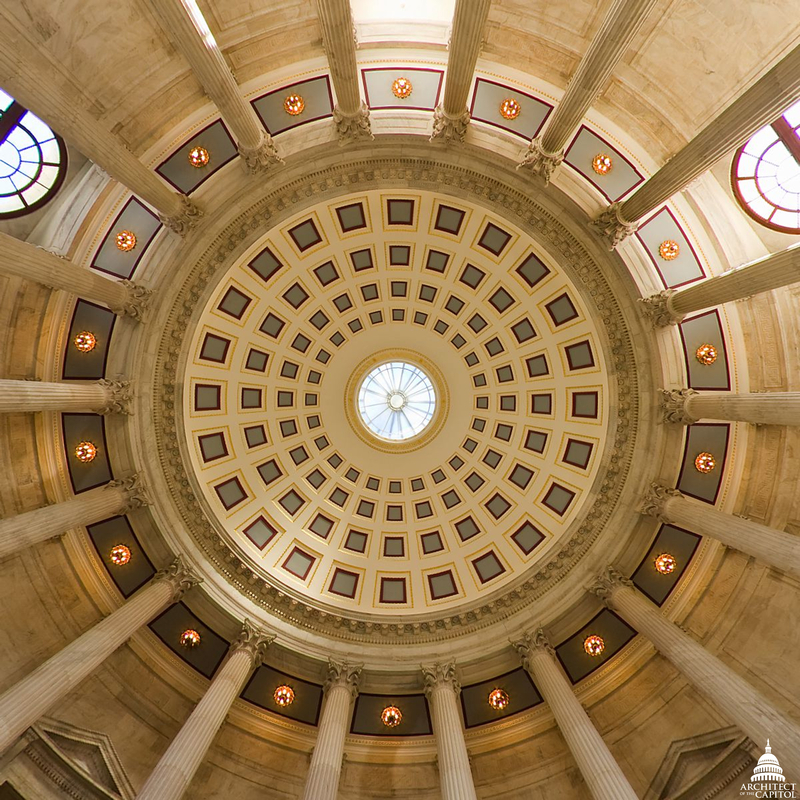 Their Beaux Arts designs were restrained complements to the Capitol. Architecturally, their elevations are divided into a rusticated base and a colonnade with an entablature and balustrade. The colonnades with 34 Doric columns that face the Capitol are echoed by pilasters on the sides of the buildings. Both buildings are faced with marble and limestone; the Russell Building's base and terrace are gray granite. Modern for their time, they included such facilities as forced-air ventilation systems, steam heat, individual lavatories with hot and cold running water and ice water, telephones, and electricity. Both are connected to the Capitol by underground passages. Originally, there were 98 suites and 8 committee rooms in the Russell Building; the First Street Wing, completed in 1933, added 2 committee rooms and 28 suites. Of special architectural interest is the rotunda. Eighteen Corinthian columns support an entablature and a coffered dome, whose glazed oculus floods the rotunda with natural light. 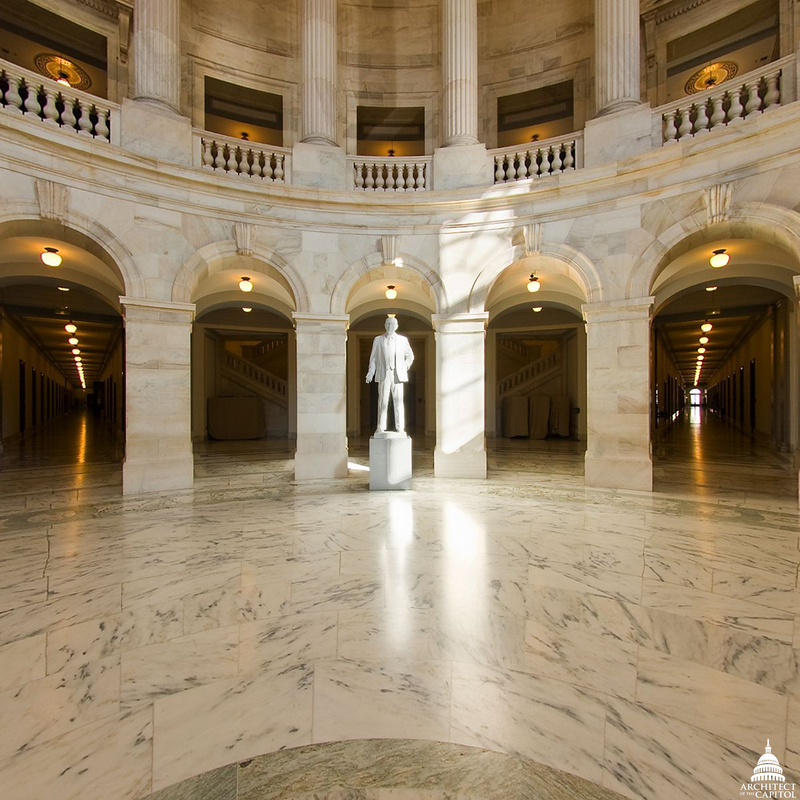 Twin marble staircases lead from the rotunda to an imposing Caucus Room, which features Corinthian pilasters, a full entablature, and a richly detailed ceiling; the Russell Caucus Room retains its original 1910 benches and settles with carved eagles. 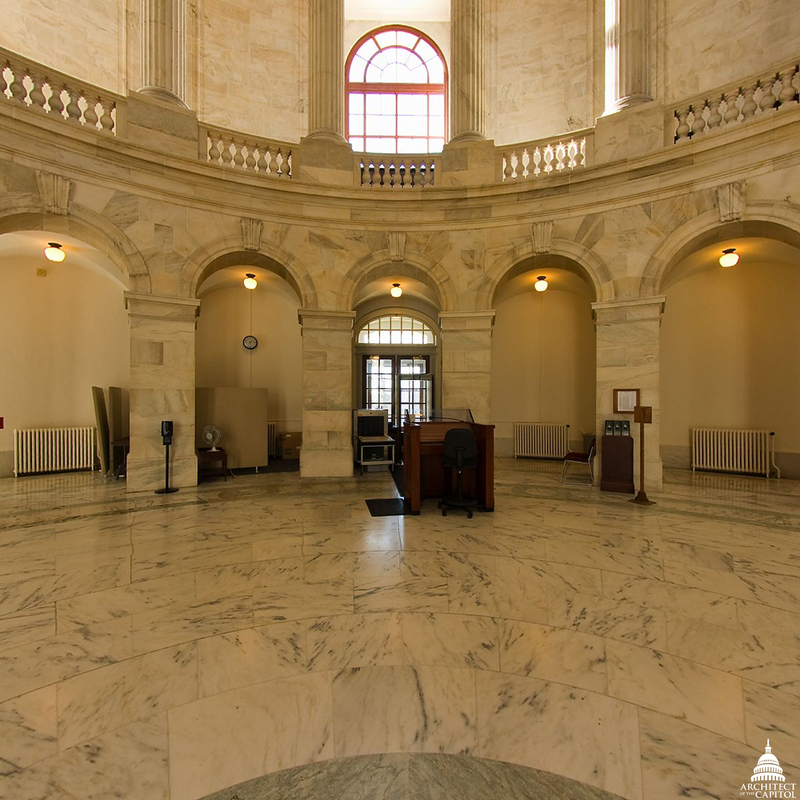 This space has been used for many hearings on subjects of national significance, from the sinking of the Titanic (1912) to Watergate (1974) and the nomination of Justice Clarence Thomas (1991). In 2009, Senate Resolution 264 designated the room as the Kennedy Caucus Room in honor of Senators John F. Kennedy, Robert F. Kennedy and Edward M. Kennedy. The Russell Building was occupied in 1909 by the Senate of the 61st Congress. The growth of staff and committees in the twenty years following its completion resulted in the addition of a fourth side, the First Street Wing, to the originally U-shaped building. Nathan Wyeth and Francis P. Sullivan were the consulting architects for the new wing, which was completed in 1933. In 1972, the building was named for former Senator Richard Brevard Russell, Jr.